Heavy Turnout, Confusion Over Voter ID Causes Some Issues : It's All Politics Election Day brought the usual reports of malfunctioning voting machines, and voting-rights lawyers said they received reports from Pennsylvania that some residents were erroneously being told they needed photo ID. But even in battleground states, there were few reports of major problems by late evening. 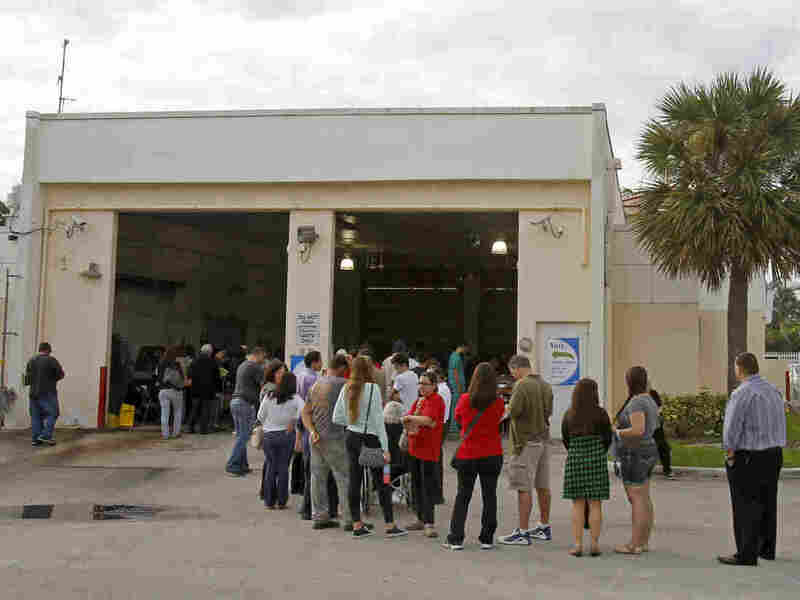 Voters stand in line as they prepare to cast their votes in Hialeah, Fla., on Tuesday. Ever since the surreal presidential election of 2000, voter access on Election Day has come under increased scrutiny. Tuesday was no different, with heavy turnout and confusion over new laws causing some issues. But even in battleground states, there were few reports of major problems by late evening. Close attention was being paid to reported difficulties voters faced at polling places because of the anticipated closeness of the presidential race between President Obama and Republican Mitt Romney, and concerns about problems created by the impact of Superstorm Sandy. In battleground states like Florida and Ohio, and other important states like Pennsylvania, there were the usual Election Day reports of malfunctioning voting machines. But other problems were related to more recent controversies over early voting and voter ID requirements. Election Protection Coalition, an alliance of legal groups working to protect voters' rights, said that by 5 p.m. EST on Tuesday, it had received 71,809 calls from voters reporting difficulties. That compared with 100,00 for all of Election Day four years ago. Barbara Arnwine, executive director of the Lawyers Committee for Civil Rights Under Law, called the voting situation in New Jersey a "catastrophe" in a teleconference early in the day. The state's plan to allow voters displaced by the storm to email their ballots foundered early in the day when computer servers in Hudson and Essex counties failed. In both New Jersey and Pennsylvania, voters were being asked for identification by some officials in polling places. That was despite New Jersey not having a voter ID law and Pennsylvania's controversial law requiring photo ID having been struck down by a federal court weeks ago. Still, some Pennsylvania officials, at least early in the day, were asking for identification. "A huge concern is the confusion in Pennsylvania over photo ID. This is the fault of the Pennsylvania state government," said Arnwine. "We lay it at their foot that voters are having so many problems in that state. The government simply hasn't done its job of informing voters that ID is required only for first-time voters or first-time voters in the county if they registered by mail. ... Still signs are posted outside polling places saying ID is required." The problems in all-important Ohio seemed to center on malfunctioning voting machines, which weren't scanning ballots correctly. The Election Protection Coalition said the malfunctions appeared to mainly be in Cleveland, Dayton and Toledo, cities with heavy concentrations of Democrats. As a result, Arnwine said, election officials were placing some ballots that couldn't be scanned and couldn't fit in "emergency ballot boxes" into boxes meant for provisional ballots. That raised concerns for election lawyers that those ballots might be confused with provisional ballots, which by Ohio law can't be counted until Nov. 17 at the earliest. In Florida, there were reports of election officials erroneously sending some voters to the wrong precinct, which could wind up with voters being forced to cast provisional ballots, Arnwine said. In numerous jurisdictions around the nation, especially battleground states, voter turnout caused long lines at polling places, which still existed at the time the polls closed. That caused officials in numerous places to let voters who were in line at poll closing to cast ballots. Bob Edgar, president of Common Cause, which was part of the voter-rights alliance, said the patience of voters — many of whom waited in line for hours before they could cast their ballots — was a positive amid all the reported problems. "We're also hearing stories of hope and fortitude. Voters are staying in line until they can cast their ballot," said Edgar. "Young people are voting for the first time. ... Voters are standing up and voting. They're turning out. They're having their say." Edgar also commended officials in New Jersey and New York for their efforts to make it possible for displaced citizens to vote. For instance, he said, New Jersey allowed those affected by the storm to cast provisional ballots anywhere in the state. Meanwhile, Pennsylvania issued a directive allowing first responders from the state who traveled to help rescue and recovery efforts in the region to cast absentee ballots.